The Twins kick off a 4-game series with the hated Chicago White Sox tonight. I say hated with complete disregard for everyone else’s opinion. I say hate because I hate them. Hate comes at various levels and I realize that some of you may be indifferent to the White Sox but with me… I would unplug their life support in order to charge my phone. Any self-respecting sports fan should have a team that you hold the exact amount of unreasonable hate for another team as the amount of unreasonable love you have for your team. 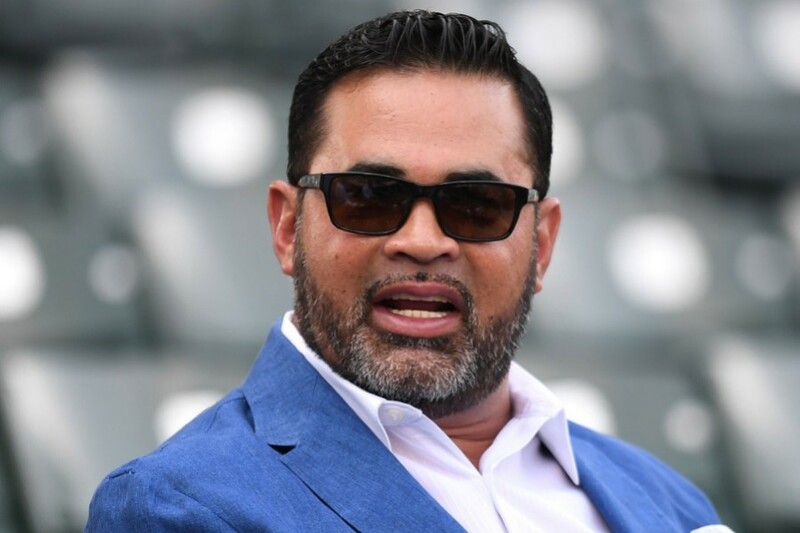 If you don’t… you are an unbalanced sports fan and you are the type of fan who can get pushed around by Ozzie Guillen types because both feet aren’t set. This balance is also necessary in regular life as well. I had to marry another woman that I hated as much as the wife I love. BTW… a 4-game series is awfully optimistic as of right now. I just saw the weather man predict 6 to 12 inches of snow at Target Field Friday night into Saturday. Strangely… no snow is being predicted for Target Center across the street. The Millcreek School District outside of Erie, Pennsylvania has distributed baseball bats to all 500 of their teachers. It was a mostly symbolic gesture but yet they were distributed with the intention of providing a last resort option to fight back with, in case they find themselves in the extraordinary situation of needing them to fight back with. Community residents were polled online, 70% were in favor of arming the teachers with bats. Among the 30% not in favor were the baseball coaches who have since cancelled practice because they lacked important equipment. That was the defending world champions that came to town and left town losing the 3-game series. What a difference a year makes… I hate to bring up painful memories but last year at Target Field, the Astros swept the Twins 16-8, 7-2 and 17-6. That’s 40 runs allowed last year compared to 11 allowed this year. At that rate of improvement, next year Houston will score -18 runs. Remember what the Astros did to us last year. It is exactly what we should do to the White Sox this year. These guys are still young and not ready yet. Four of the five starters in their rotation have ERA’s over 5. Yeah, I know… small sample size, but these ERA’s have been compiled against the Royals, Jays, Tigers and Rays. Only the Jays resemble a decent offense of that group and even that is questionable on paper. If there was ever a series that you didn’t want any games cancelled due to weather… this is it. A dominant series would stretch the first place lead and you want to play the White Sox NOW… not later when the young players get smarter. Send emails to your local weatherman… demand that they make adjustments to those computer models. Maddon: Guys… I don’t know how long I can keep making these early morning meetings to talk about nothing in particular. The travel is killing me… we got 162 games to play and every morning it’s back here just to hang out for a few minutes and then back to Chicago or Cincinnati or Pittsburgh or San Diego. My wife is really starting to question the logic of it. Montana: C’mon now… you don’t hear Mauer complaining and he does the same thing. Morgan: If Joe can do it… so can you. None of us live here… we all have to travel. Maddon: I’m just saying… we could Skype or something, maybe a daily webinar. It would cut down on the travel. McCarthy: You always do the cooking… how would we? I mean… nobody else can cook. You can’t Skype Eggs Benedict. Maddon: Yeah, I get it… it’s just that the travel is expensive. Montana: What do you care? Mauer pays for it all anyway. Maddon: Yeah… you’re right… OK… today I’ve prepared… crêpes with caramelized pears. Morgan: Free meals always taste better. Montana: Did you bring the beer? Mauer: Yes… here ya go. Whenever a crime is committed, a conviction is much easier to attain with a witness. Whenever an accident occurs, a witness can provide unbiased details to help determine fault. Crimes, accidents and marriages... you need witnesses. Gametime forecast: Mostly cloudy, 47 deg F (feels like 43), 4% chance of precipitation, winds at 8mph from the NE. Chocolate milk stout, for sure. Mauer provides the beer... along with everything else. After that... nobody knows because nobody is really paying attention. "I wasn't listening. I was just waiting to talk." Resembles my own mantra, which is: "I wasn't listening, I was waiting to enjoy the silence." My wife says she doesn't know whether I have a hearing problem or not, but she is sure I have a listening problem. I hate 2 teams not just 1. Sox and Yankees. I'm with you Riverbiran. Most here hate the Yankees but it has always been the White Sox for me. It was more fun when they were our closest rivals but still.The odd thing is there are really not all that many none Twins that I like but I liked Konerko, Thome, Buehrle and Crede and always wished they played for us just because. 2 of 4 did end up playing here which did restore some harmony in the universe for me.Great write up once again. Son of an Ozzie!I hate these Sox...OK, I don't even know who most of these guys are, but I still hate them.Two bench clearing brawls yesterday and I'm thinking a snowball fight is in order for this one.Go Twins! OOH!But here is one good thing about Chicago.Lake Shore Drive!The song...by Aliotta Haynes Jeremiah.They don't make them like this anymore.Enjoy! Slipping on by on LSD. . . discuss. Lucas Giolito - who used to live beside the ocean - has had some command issues with 7 walks and 4 hit batters in 11 plus innings so far this season. Twins need to stay with the patient approach that Mr. Kepler spoke of yesterday. Make Giolito feel lonely and dreaming of the west coast while out on the cold, dampish, 43° Minnesota mound tonight, and I think the good guys can have some big innings. On a related note, the White Sox also lead the league in getting hit, so this might not be the series for heavy Duke usage. 43 degrees in Minnesota? Heat wave!! Hoping for Lance Lynn to play Doc Ellis on Saturday?I just don't see Berrios being that guy.Lynn has seemed crazy enough in some of his interviews that, well, maybe. Well, the authors swear that while drugs were involved while writing it, the song is about a drive around Chicago...given that it was 1971, there may have been a subtle reference there...subtle...or not so subtle.That may be why I never heard it on the radio. Got no problems with the White Sox. Used to wear them all the time in high school. The Yankees now, that's a whole 'nother story. The arm on my Detest-o-Meter goes right through the Bete Noire reading when anyone within 40 feet even mentions the Yankees under their breath. I especially despised and detested the media's fascination with Derek Jeter. No matter if the Damn Yankees were winning or losing any time somebody in the stadium farted six cameras would scope out Jeter so we could witness his reaction. The names have changed, but the reaction is still the same. My favorite day of the season is the day when the Yankees are eliminated from the playoffs. Fun Fact: According to MLB's Social Media sites, the only two teams currently active in Major League Baseball are the Yankees and whomever is playing the Yankees. Pour it on Twins fans, pour it on. I hate the White Sox too. That said, even though I'm a third generation Cubs fan with season tickets in the family since the 1950s . . . White Sox fans are way better. They give a crap about the team, they're more diverse, they aren't douches. I hate them but I have to accept that they're decent fans who are constantly being overshadowed by their flashy older brother.